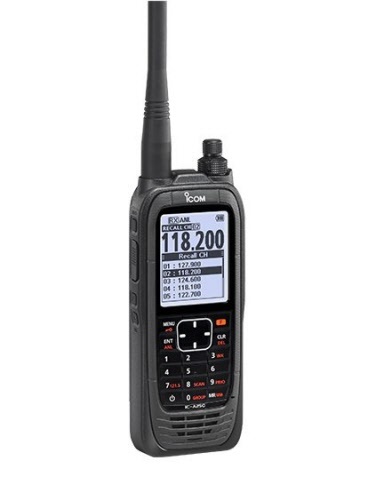 The IC-A25CE is the latest development in airband radio technology. Featuring 6 watts of output power, this stylish modern design, easy-to-use interface and large 2.3-inch LCD combine to provide stress-free programming and easy in-flight operation. The handheld includes a large 2350mAh Li-ion battery, providing longer operating time. For expanded communication coverage, output power has been increased to approximately 6 W typical (PEP) 1.8 W (carrier) compared to the IC-A6E (5/1.5 W (PEP/carrier)). The IC-A25CNE stores the last ten channels used. You can easily recall those channels by using the directional keys or the channel knob or the keypad. This is convenient for switching between several channels. You can also freely edit (replace, delete, and change order) the stored recall channels.